Election Countdown provides individuals with an opportunity to review past elections and projections for future elections. This page notes the way each state voted, whether Democratic or Republican, according to that state's electoral college vote. Election Countdown has chosen to start with the 1992 election because that's approximately when the Internet became public and was open to private businesses. 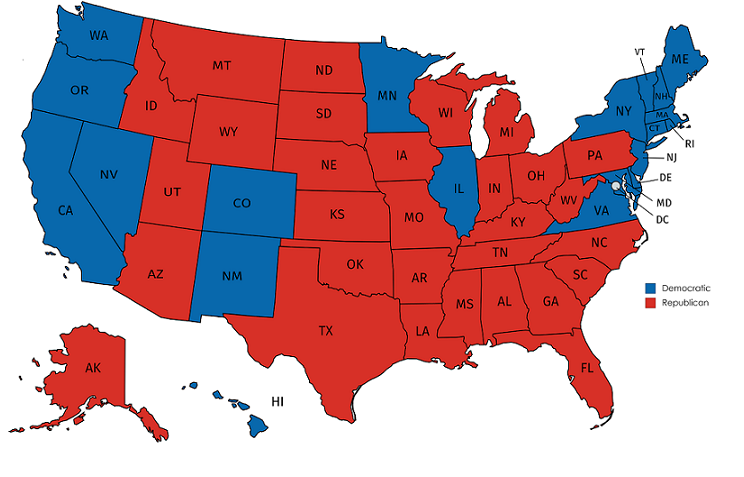 * The columns to the left of the page represent each state's number of electoral votes, and to the right is a graphical representation of the United States illustrating how each state voted. The maps are in descending order. *"In 1993 the U.S. National Science Foundation, after a competitive bidding process in 1992, created the InterNIC to manage the allocations of addresses and management of the address databases, and awarded the contract to three organizations. Registration Services would be provided by Network Solutions; Directory and Database Services would be provided by AT&T; and Information Services would be provided by General Atomics." See document: http://www.ripe.net/ripe/maillists/archives/lir-wg/1992/msg00028.html. NSF NETWORK INFORMATION SERVICES AWARDS. Retrieved 12/25/05.